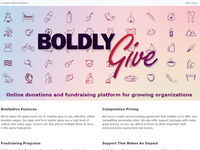 BoldlyGive is online donation and fundraising software for growing organizations. Credit Card processing fees additional. We've taken the guess work out of creating easy to use, effective, online donation pages. Our page and form builder gives you a high level of control over every page. Donors can also give to multiple items at once, in the same transaction. BoldlyGive has served my company's needs well. I am very happy with the product. Pros: The software allows me to offer an online platform for my fundraising business, which in the past I did not have. As I continue to work with the developer of BoldlyGive's software to tailor his software to my business, he has been outstanding in adapting the software to my specifications. I especially appreciate the timeliness of responding to questions and tech support. It is outstanding!! Cons: Since I am only a year into using BoldlyGive, we are still making adaptations to my business through the software as we strive for my fundraising site to be as user friendly as possible. To their credit, Boldly Give is very committed to working through "ease of use" issues that arise. Overall: The software enabled me to create an online platform by which donors could contribute to schools' fundraising projects. We took a chance on Boldly as a start-up and have not been disappointed. Pros: We explored and tried various solutions for online payment processing of multiple projects until settling on Boldly Give. Other solutions were either skewed towards single-entity donation management or website management. Boldly provides us a good balance of tools to do both from the same environment. The capabilities have consistently improved and the responsiveness to issues and feature requests have been excellent. . For our needs and budget it has been a great fit. Cons: The website management tools are less friendly than other WYSIWYG solutions but acceptable and an easy trade-off to be able to manage donations for multiple projects and associated website content from within the same environment. Overall: Single environment for managing online donations for multiple projects along with associated website content.